More homeowners and landlords will pay city improvement taxes in a planned business district expansion. Residents can ask questions in a meeting Wednesday from 6 to 8pm at the Ukrainian Institute of Modern Art, 2320 W. Chicago Ave. Representatives of the West Town Special Service Area 29 will be on hand. 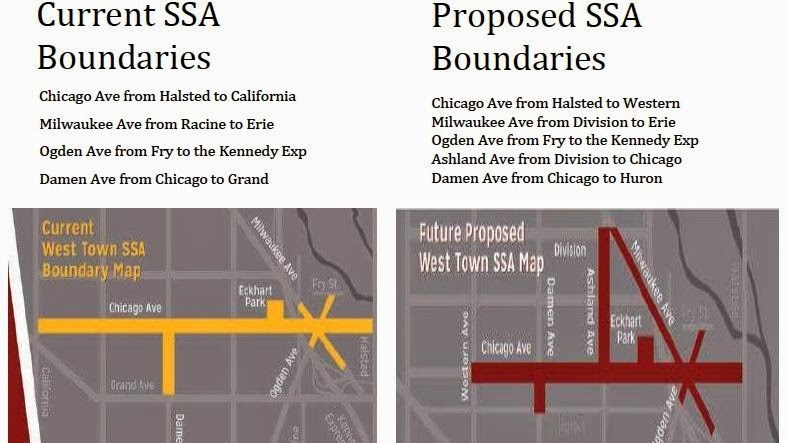 The East Village Association and Ald. Proco Joe Moreno are sponsoring the meeting, and EVA encourages all residents to attend. Two-thirds of properties in the district are residential, according to an SSA consultant. It estimates that the SSA tax for a condo owner with a $70,000 equalized assessed property value would total $366 a year. Details are in the SSA 29 presentation. EVA has been seeking an agreement on the level of service residents should expect from the district, and easier access to financial information. The majority of its $572,000 budget for 2015 covers extra trash pickup and other maintenance, aesthetics and facade improvements. Administration accounts for 27%.